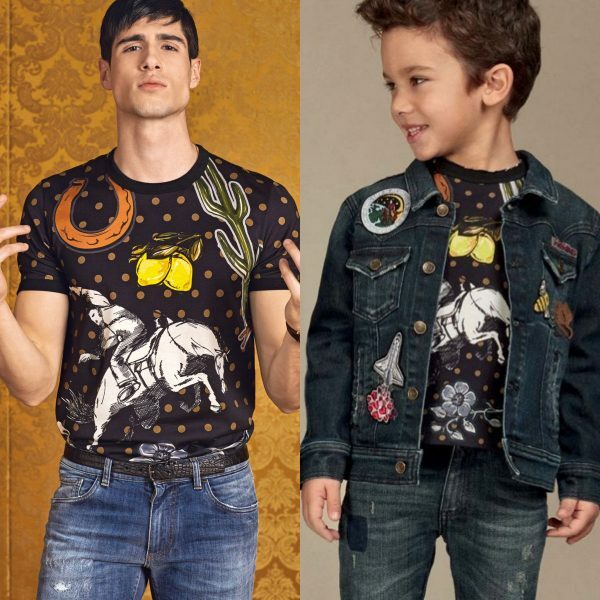 Super cute mini me boys Sicilian Western themed look by Dolce & Gabbana Boys featuring this adorable black and green dotty top with the the designer's 'Sicilian Western' print of horseshoe, horse, cactus and fruit, with a heart at the back. Complete the look with a pair of matching Sicilian Western Jeans and jacket. This cool daddy and me look is inspired by the D&G Mens Fall Winter 2016 Runway Collection featured at Milan Fashion Week.